"Chappaquiddick" redirects here. For the Ted Kennedy incident, see Chappaquiddick incident. For the film based on the incident, see Chappaquiddick (film). 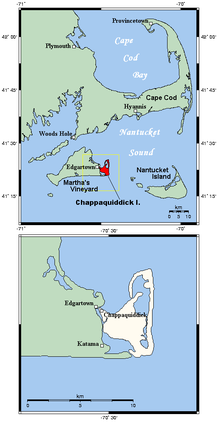 Chappaquiddick Island is connected to Martha's Vineyard with the southern barrier beach between Katama and Wasque. Chappaquiddick Island ( Massachusett language: Noepetchepi-aquidenet;  colloquially known as "Chappy"), a part of the town of Edgartown, Massachusetts, is a small peninsula and occasional island on the eastern end of Martha's Vineyard. Norton Point, a narrow barrier beach, connects Martha's Vineyard and Chappaquiddick between Katama and Wasque (pronounced way-sqwee). Occasional breaches occur due to hurricanes and strong storms separating the islands for periods of time. Most recently, the two were separated for 8 years from 2007 to 2015. Though both land forms have, over the course of history, mostly been connected to one another, Chappaquiddick is nevertheless referred to as an island. Visitors come to the isolated island for beaches, cycling, hiking, nature tours and birding, and the MyToi Gardens, a small Japanese garden created amidst the native brush. Two fire trucks are stationed on the island from Edgartown. Chappaquiddick Road and Pocha Road, both paved, provide access to sandy, woodland roads, trails, and shorelines. Chappaquiddick became internationally known following an incident in 1969, when U.S. Senator Ted Kennedy claimed to have accidentally driven his car off the island's Dike Bridge, fatally trapping his 28-year-old passenger, Mary Jo Kopechne, inside the vehicle. The island was once mainly the home territory of the Chappaquiddick band of Wampanoag Indians, and remained exclusively theirs well into the nineteenth century. They still have a reservation of about 100 acres (40 ha) (40 hectares) of brush land in the interior. Early colonists settled Edgartown in 1642, and quickly proclaimed Chappaquiddick as village property. The first homes owned by people of exclusively European descent were built around 1750; these residents raised livestock and farmed the land. The Trustees of Reservations, a non-profit conservation organization, owns and manages nearly 1,000 acres (405 ha) of land from the southeastern point,  Wasque, to Cape Poge, at the northeast. Wasque is a popular fishing spot for catching bluefish, striped bass, and other species. The Cape Poge Lighthouse, first erected in 1801, has served ships navigating the shoalwaters and shallows of Muskeget Channel. Chappaquiddick is mainly defined by its diverse land and water ecologies with expansive salt marshes, ponds, red cedar woods, grassy meadows, and coastal wildlife including sandpipers, piping plovers, blue heron, osprey, and oysters. The main interior bodies of water include Cape Poge Bay, Katama Bay, and Pocha Pond, all salty. Chappaquiddick is located at 41°22′34″N 70°28′33″W﻿ / ﻿41.37611°N 70.47583°W﻿ / 41.37611; -70.47583. The United States Census Bureau defines it as Block Group 1, Census Tract 2003 of Dukes County, Massachusetts. It has 15.915 km² (6.145 sq mi) of land. Administratively, it is part of the town of Edgartown and Dukes County. As of the census  of 2010, there were 179 people residing on the island. The racial makeup was 93.3% White, 1.7% African American, 0.6% Native American, 0.6% Asian, and 1.7% from two or more races. Hispanic or Latino of any race were 2.2% of the population. Socially, its residents form a tight-knit community and see themselves as distinctly separate from the rest of Edgartown. [ citation needed] Longtime residents speak of "going to the mainland" when they travel to Edgartown and of "going to America" when (for example) they travel to Boston or Cape Cod. Access to the island is served by privately owned barge-like ferries named the On Time II and On Time III which shuttle pedestrians, bicycles, and up to three cars at a time between Chappaquiddick and Edgartown, on Martha's Vineyard. Two ferries run during the summer months and one during the off-season. Oversand access is possible with four-wheel drive vehicles on the south shore when the islands are connected and conditions permit. Events at Chappaquiddick Island gained international attention on July 19, 1969, when the body of Mary Jo Kopechne was discovered inside an overturned car in a channel on the island. The car belonged to U.S. Senator Ted Kennedy, who claimed to have accidentally driven it off a bridge late the previous night and did not report the incident to the police until the next day. The morning after the accident, a diver recovered Kopechne's body from the submerged car, and Kennedy later entered a plea of guilty to a charge of leaving the scene of a crash causing personal injury. ^ "Chappaquiddick Wampanoag". www.chappaquiddick-wampanoag.org. Retrieved 2015-04-04. ^ "Spring Gale Roars Through Island, Norton Point Is Breached". Retrieved 2015-04-03. ^ "Land Meets Land; Norton Point Breach Closes". Retrieved 2015-04-03. ^ "GNIS Geographic Names Information System Query". geonames. USGS. ^ (Steel; Douglas-Lithgow 1909; MGB 1932). ^ "Cape Poge Wildlife Refuge | Chappaquiddick, Martha's Vineyard | The Trustees of Reservations". www.thetrustees.org. Retrieved 2015-04-03. ^ "Cape Poge Wildlife Refuge | Chappaquiddick, Martha's Vineyard | The Trustees of Reservations". www.thetrustees.org. Retrieved 2015-04-04. ^ "As Breach Retreats, Erosion Picks Up Speed". Retrieved 2015-04-04. ^ Gross, Michelle. "Living on the edge, Wasque home safe for now". Retrieved 2015-04-04. ^ "Chappy Ferry". Chappy Ferry. Retrieved April 3, 2015.